People interested in Kombi Keg WA also enquired with the Wedding Hire suppliers below. Kombi Keg WA has been in business since Jan 2016 and offers world-class service for any event or function you can possibly imagine! We are known for our old-school VW Kombi vibe and classic look, with the Kombi Keg WA Van Called Vicki! We are a young newly wed couple ourselves! Eliza and I married down at Donnelly River in South West WA in May 2018, so we have recent experience at the budget stress a wedding can bring! Needless to say, we are a fan of the BYO wedding scene, and not just because our business depends on it! We can bring back the old school look and with the Kombi Keg we feel this is great for any event. The staff we work with have had extensive training and has mastered the best way to make your event special. Whether you want a vintage, classic, or modern look, we're here at the Kombi Keg WA Crew to help you! The hire rate varies depending on what your event needs and the events location. Let's start the conversation. Contact us and we'll work out the best package for you and your event. Perth’s best value party bar just got better! Make a booking for an overnight hire of our beautifully restored Kombi Keg’s overnight and we’ll throw in our Deluxe Photo Booth for $1! Have you ever met a photobooth you did not enjoy? 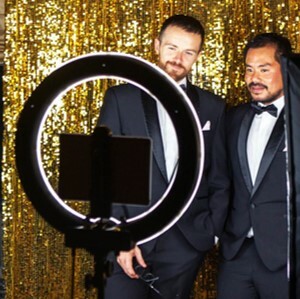 Renting a photo booth can cost between $500 - $1000 AUD for a matter of hours! **Already booked the Kombi Keg and want the photobooth? Reply to the email and we’ll be happy to help! Dates fill up fast so book now to avoid disappointment! Click the link’s below for our standard pricing or reply to this email to check your date and let us work to your budget!